Jan Burton, an incumbent running for a second term in the 2017 Boulder City Council election, feels she’s ready for and deserving of another term on Council—and stated that this would be her last term, whether she potentially earns a two-year or four-year term in this election. “It does take at least a year to learn what’s going on and get the pace of it, so now I feel like I’m at the place where I can make a difference, and add value to the city and to the Council,” said Burton on her decision to run again. Burton’s first run for elected office was in the 2015 Council race, when she received 8,986 votes and finished fifth in a race for five seats, earning a two-year term. However, despite her lack of a political resume, she brought a significant amount of professional, board, and life experience to the table. She was born in northwest Kansas, with parents both being teachers, and she moved within Kansas several times before winding up in Kansas City. Burton’s parents are both still alive, and she has a sister. The family visited the neighboring state of Colorado often for vacations, which involved camping trips and outdoor adventure. After graduation from high school, Burton enrolled at Kansas State University, at first intending to become a coach since she was a gymnast for KSU, but she didn’t want to teach gym. She moved on to major in journalism, but that too was not meant to last. “It was all about writing about Vietnam back then, and our horrible relations around the world, and that didn’t please me very much,” said Burton. She then took a marketing class, and this discipline stuck. She graduated with a degree in Business and a minor in French, with the French language and its culture another fascination of hers. The business degree led to a job selling computers for IBM straight out of college, the beginning of a career in the tech field that included jobs with firms including Apple, Lucent Technologies, and Motorola. During her tech career, she lived overseas three times—twice in the United Kingdom and once in Belgium. She credits her experience for a perspective in favor of balancing what she calls the “3 Ps”—profit, planets and people—along with other aspects of her work ethic that she believes are pertinent to her responsibilities on Council. “What that gave me was the ability to listen and learn. In high tech, you have to be able to change and lead things, because the whole product line and industry in the early days was changing every two years—so you had to be very flexible with the ability to change with the times…I try to listen and evaluate things on their merit rather than coming in with a particular point of view,” said Burton. For an example of her thought process, she recalled a situation several months after being elected to Council, when a major water main break severely flooded about 20 homes in north Boulder. She said the City did not believe it had legal liability for the water main breaking, therefore would not provide financial assistance for repairs. Burton didn’t believe this was right and fought to get the homeowners reimbursed, and eventually they received partial payment for the damage. Moving from the city’s water utility to the potential municipal electric utility, Burton came out against voting for the ballot measure calling for an extension of the occupation tax that funds the effort to create the muni. In early September, she said the tax would cost taxpayers another $16.5 million on top of the roughly $13 million spent already, with activity on the muni to date having taken some money from Boulder’s reserves, and she believes that the recent Public Utilities Commission ruling on Boulder’s application was not largely supportive of Boulder’s efforts. “I am an environmentalist and I supported the goals of the muni, but I think the regulatory and legal challenges are too great for us to overcome. Plus, I’m not convinced that going it alone is the best way to achieve climate change results. I think by working with Denver, other communities, and the state to influence Xcel, we can get better results,” said Burton. Regarding current growth in Boulder, Burton said she “fully supports” some of the growth limitation measures voters have passed over the years, including the Blue Line, the building height limits, and the Danish Plan. However, she said the city has not done well enough in creating a dense urban core, among the supply/demand factors that lead to very high local housing prices and could leave the future Boulder a homogenous community made up largely of older, mostly white people. She served as a Council member on the city’s Middle Income Housing Strategy Working Group, and the city eventually adopted a plan that included a goal to build or preserve 3,500 housing units affordable for middle-income earners by 2030. She also favors allowing more townhomes, condos, Accessory Dwelling Units, and potentially rezoning areas such as East Arapahoe to create more housing near large employers. Burton also volunteers as a raptor monitor for the city’s Open Space and Mountain Parks (OSMP) department, which she describes as extremely fulfilling between witnessing the beauty of the falcons and the time spent outdoors. 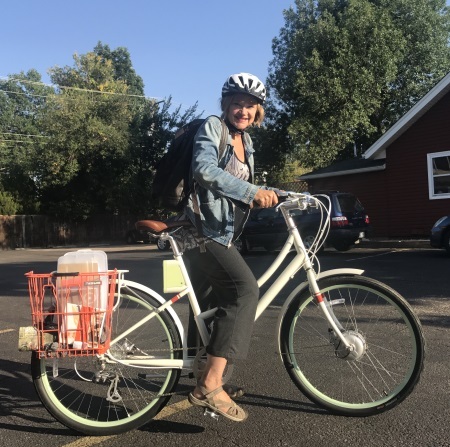 Regarding the future of OSMP, she believes the department should make sure more of its trail system connects with other trails on other properties, in part so more cyclists might not need to drive to trailheads. Also, she sees opportunities to use certain properties for agriculture, combined with educational activities so urban dwellers can visit and see where their food comes from. “We have used our money wisely to acquire all this open space, and there’s not a whole lot left to acquire. I believe we need to start transitioning toward maintenance and safekeeping, and I think we need more patrols to make sure that we don’t have fires,” said Burton. Burton is a co-founder of Rhino Cubed, a small business that sells tiny homes made out of reusable shipping containers. She was interviewed for this profile shortly after Hurricane Harvey decimated Houston, and mentioned that while it isn’t always easy to find a place to locate tiny homes, they are ideal as temporary units in case of displacement after a natural disaster. She is also a pilot, serves as secretary of the KSU Foundation Board, and is a member of the University of Colorado Leeds School of Business Women’s Council. She regards governance among her top concerns, and favored last year’s Council term limits ballot issue—in part to make way for more newer participants and younger people to get involved in local politics. She believes another way to make participation attainable for working people is to reduce the number of issues Council tackles, with prioritization possible to determine through survey results, which can help make sure Council members can have some life balance as part-time members—without the need to lose sleep thanks to late-night meetings. “The community has told us time and time again, by not increasing our salaries, that they want us to be part-time, so we need to be part-time. So, I am all about using the data we have, picking fewer priorities, and executing those priorities really well,” said Burton. Burton is one of the five candidates endorsed by Engage Boulder, Better Boulder, and Open Boulder. As of September 29, Burton had received $100 maximum donations from current Council members Aaron Brockett and Bob Yates; former Council members Leslie Durgin, KC Becker, Gary Myre, Richard Polk, Gordon Riggle, Suzy Ageton, George Karakehian, Ken Wilson, Bob Greenlee; and others.